The 32-year-old faced on-track temperatures of 38 degrees but kept his cool to use his Attack Mode to perfection in first overtaking Pascal Wehrlein and then Sebastien Buemi after an error from the Swiss driver sent him into the wall. A potential Formula E star was born in rookie Wehrlein who scored his first ever podium in just his second Formula E race – admitting afterwards that he would have liked to have pushed Bird harder to take victory. His countryman Daniel Abt finished third for Audi - their first podium of the season. Formula E is famed for its street-racing and the dirty street track caused more chaos which has marked the Season 5 season with only 14 of the 22 drivers being able to finish the race and regular contact between them. 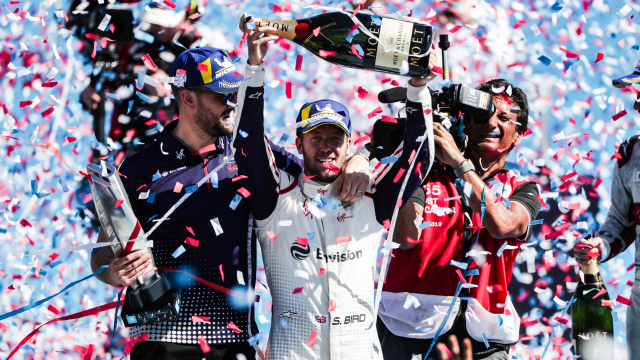 But with reigning champion Jean-Eric Vergne retiring from the race and the first three races seeing three different winners and seven different drivers of four different teams on the podium the Championship is up in the air. Bird was joined in his garage earlier in the day by popstar Rita Ora who was the latest in a long line of celebs to flock to experience what Formula E had to offer - and was able to cheer on her countryman to victory. Having also experience being given a full-speed hot lap of the Santiago track in the BMW i8 Safety Car by Formula E Chairman and Founder Alejandro Agag, Ora insisted she was another Formula E convert. She said: "The lap was amazing - I didn’t expect it to be as fast as it was to be honest. I’ve seen all the other kinds of car racing, but this is so unique and incredibly futuristic. It’s so amazing to see the electric energy and the cars are really similar in some ways but because it is clean it is actually better. "I think Formula E is different because the car just goes straight away, there’s no slow start. It’s straight in and obviously healthy for the environment but at the same time it’s fast and furious - it genuinely is. I’m very happy and had an amazing experience, so much fun. "Alejandro took me round. I don’t know what he’s like as a driver because I haven’t compared him to anyone yet but it was great. I’ve got to see the drivers first, but you know what, I felt safe. Apart from that skid the first time round that is! "[The fight against climate change] is undeniably one of the most important things in the world right now and I feel like the more attention we bring to it the better it is for everybody, and it’s so easy too. It’s one of those things that isn’t hard to achieve, it just needs a lot of support. That’s half the reason I was here today, and also to have a bloody good time."